Today is Good Friday, a day all Christians around the world revere because of the importance of what it symbolizes for us. Let me say here that I am first of all a Christian before anything else in the world. It was because of the sacrifice of Christ Today that I can call myself a Christian. Thanks to that sacrifice and the teaching of Jesus Christ I am alive today. Had the devil had his way, I will have been dead a long time ago when the enemy nearly took my life. 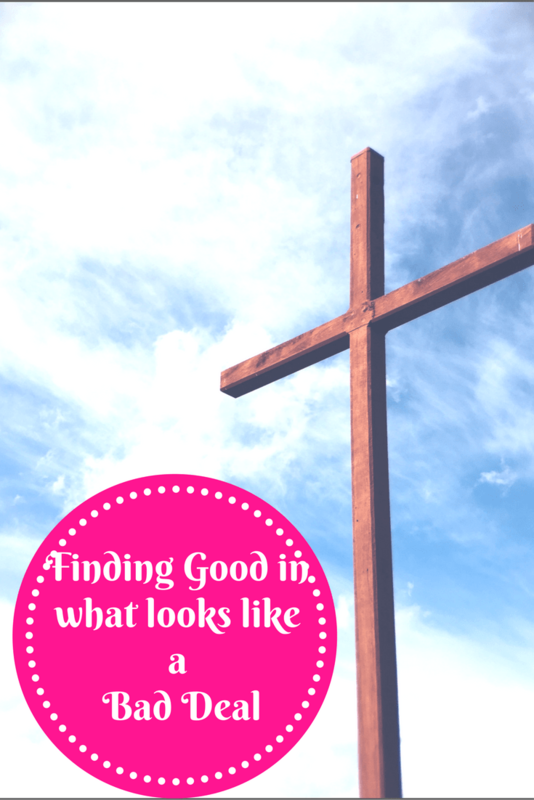 So today we will be talking about finding the Good in what seems like a bad deal, this early morning, I was sharing a cup of tea with my 4 year old son , I took the time to explain to him what today means to us as Christians and the significance. Though I know he may not understand all that I shared with him, it means much to me that I will have the time to share my Faith with my son. It’s my basic building block for life and I want him to have that as he grows. There will be times in our lives when what is happening around us seems like a bad deal, I mean think of the Apostles dilemma today as they watched he one they had followed for 3 years dragged off like a common criminal to be crucified. The one who had raised the dead, healed the sick, even pulled money out of a fish is now being pushed around, spat on and condemned like a common criminal. For them it must have seemed like the end of the world, I mean where else could they go, like Peter asked when Christ asked them in John 6:68 if they will not also leave him. But we have been taught by the word of God that all things works together for good for them that Love God. It means that no matter how bad things may seem today, there is always a good that can be found in it. It’s like the scripture in Isaiah 65: 8 that says, as a new wine is found in a cluster and they say do not destroy it for there is a blessing in it. You will not be destroyed for there is a blessing still in you. Today turned out to be the greatest day in history as the eternal sacrifice for our sin was made and mankind was redeemed from the shackles of darkness, our eternal heritage which Adam traded away was restored to us and we can call God our Father Again. What started out like a Bad deal, turned out to be the Best deal ever. It was the will of God that Christ lay down his life, but he wasn’t forced to , it was a choice Jesus made, for he said, I have power to lay it down and I have power to take it up ( John 10: 18). By that singular self-sacrifice, he redeemed us from the power of the devil and made a way for us. Today a way is being made for you too even as you are reading this article, God is working behind the scenes to turn that Bad deal into a good one. So if you are there right now having a tough time in your life, maybe you just lost your Job or perhaps you just resigned your job because it’s no longer convenient for your family, or you might even have just lost a loved one. Perhaps you are heavily indebted and seems like you will never get out of debt, remember that Christ paid a greater debt today, so yours is nothing compared to what he did today, he is able to save to the uttermost all that trust in him. What Christ did today covers all that and more, he is able to make a new beginning for you and pave a way where there is no way. There is always a good deal in what seems like a Bad deal. It’s not over until he says so, besides, he already says in Jeremiah 29: 11 that the plans he has for you is of Good and not evil, so arise from your doldrums and shine for your light has come. Jesus Christ gave his life today so that we may not have to be held down again, what should naturally have been a bad Friday, became good because of the ultimate good that came out of it. When you arise and begin to thank God for where you are , he will open your eyes to see the vast opportunities that are available for you, God is not through with you yet, he will still make the best of whatever Bad deal you are going through right now. I will end this piece with a song I love so much. It helps me stand strong in times of trouble. Here is the link, you can sing it and feel great. Rejoice Christ is alive and he will see you through. See you on Resurrection Morning, Happy Easter. This was an inspiring and hopeful post! Thank you, so suiting for easter! Thanks Maria. I read your post and I want to encourage you to know that you are doing all you can as mom. sometimes you may not do a great job, don’t be too hard on yourself. Know that the Love in your heart for your kids is what matters and you will come through no matter what. I am sending hugs across to you. sorry this is a bit long I was looking for where to comment on your blog but couldn’t find one.